If you have trained with CAT before, or follow us on social media, you are probably aware that we are geeks when it comes to all things motor related! We train some of the best engineers and test evaluators in the industry from our base at Millbrook Proving Ground. This exposes us to a variety of cutting-edge developments in new vehicle prototypes coming to market. Our job is pretty prestantious – never more so than now. Traditional automotive manufacturers, new industry players and the UK Government are all working towards improving the way in which we travel. Aiming to make road transport safer, more efficient and less harmful to the environment. As a consequence, we have been working with FiveAI, a talented team of AI, engineering and mobility experts who are on a mission to revolutionise urban mobility by offering a driverless shared transport service. You may have read our recent blog posts about driverless cars, asking how soon they will be a reality. Well… very soon – the age of truly driverless cars is fast approaching. 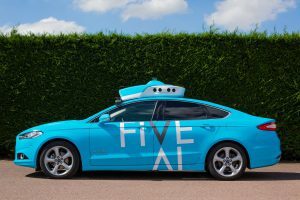 FiveAI are a company shaping the future of transport in the UK. Their goal is to significantly improve travel across Europe’s cities, reducing congestion and pollution by providing a shared self driving service that is low cost, on-demand and seamlessly integrated with existing public transportation. Training a car how to drive itself is no mean feat – considerations go far beyond the basic functionality of controlling the car. The autonomous system is subject to rigorous testing in a multitude of environments, scenarios, road surfaces and hazards – FiveAI are constructing a “driver’s brain”. Recognising their safety programme must be as robust as the technology, the team approached CAT to create bespoke autonomous driver training. Safety is paramount in every aspect of our self-driving systems. It is imperative our safety drivers are trained to the highest standard before they supervise our self-driving vehicles on the proving ground and on public roads. We identified CAT Driver Training as the go-to engineering driver development and roadcraft experts – a unique combination. 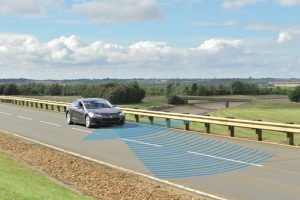 I asked Colin to create a bespoke autonomous supervision course to train our safety drivers and core engineers to an industry comparable advanced driving standard. The defensive driver training we receive from CAT ensures all our safety drivers are equipped to respond quickly and safely to any hazards that may occur, whilst maintaining a state of enhanced awareness where they can anticipate scenarios outside of the system’s current design domain and proactively take control. The training programme developed by CAT Chief Instructor Colin Hoad is a comprehensive multi-day course. Safety drivers are taught defensive driving techniques to an advanced dynamic standard. By maintaining light contact with the hand wheel at all times when vehicles are in self-driving mode, safety drivers are now equipped with the skill set required to maintain the highest standards of safety and vehicle control. It is a first for us to be training individuals to such a high level when they are not the active driver of the vehicle for the majority of the drive. External equipment and sensors add to the visibility of the FiveAI branded vehicles, drawing additional attention from other road users. This can bring behavioural change from drivers and pedestrians, meaning these highly skilled safety engineers are developing situational awareness as much as their driving and dynamic knowledge. The advanced skills and techniques learned has also contributed the core system development. CAT’s unique dynamic engineering expertise for the perfect drive has benefitted passenger comfort and safety by influencing the design of the autonomous driving system to use advanced driving techniques such as single input steering. Will we see FiveAI vehicles on the roads? The team is working towards trialling their driverless shared transport service in London in early 2020. If you would like to find out more about FiveAI you can visit their website www.five.ai or follow them on TWITTER. Our specialism – translating our dynamic driving expertise to all areas of driver development. For your engineer evaluation and advanced road skills driver training, CAT’s expert instructors will surpass your expectations. For all your driving needs, get in touch for a friendly chat and discuss your personal objectives. Call us on 01234 757 633 or email Jo at info@catdrivertraining.co.uk.